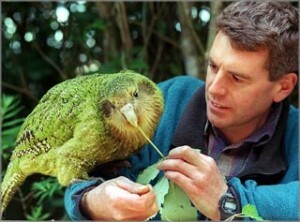 Kakapo a special fat parrot from New Zealand that can not fly. The kakapo are large and stocky parrots: males can grow to 60 cm and weigh between 3 and 4 kg after reaching maturity. The kakapo can not fly, so they have small wings relative to their size, and small bones and some made ​​in the sternum (which in other birds entrench the flight muscles). They use their wings for balance and support as well as to cushion their falls when jumping from the trees. Unlike other land birds, and living in a colder climate than most species of parrots, the kakapo can accumulate large amounts of body fat for insulation and to store energy.